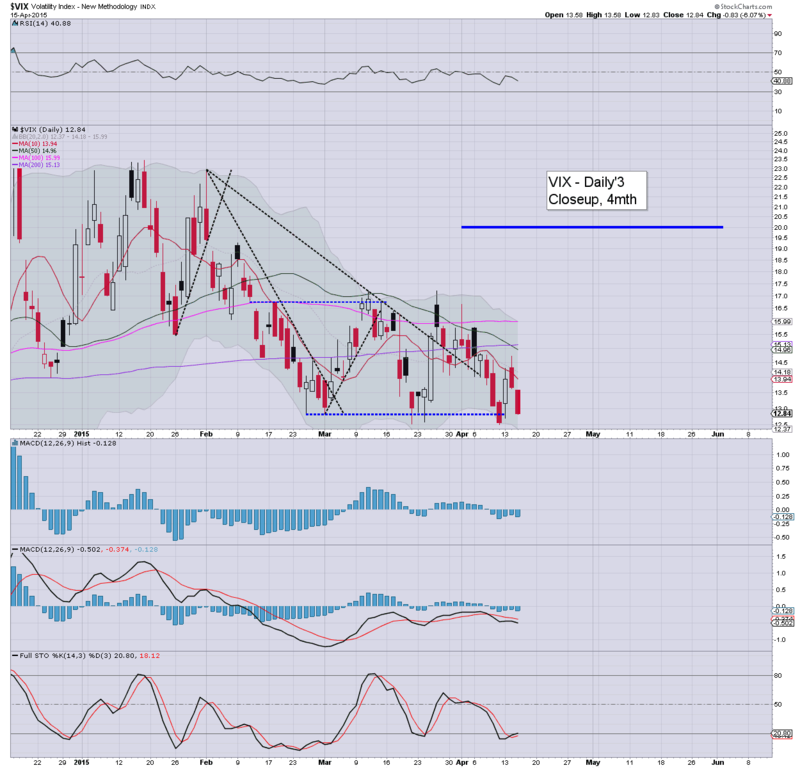 With equities climbing for a second day, the VIX remained in cooling mode, settling -6.1% @ 12.84. Near term outlook is for continued equity upside.. which should equate to VIX remaining within the 15/11 zone. Volatility remains very subdued, as the US.. and most other world markets continue to battle upward. US equities closed higher for a second consecutive day, sp +10pts @ 2106 . The two leaders - Trans/R2K, settled higher by 0.1% and 0.8% respectively. 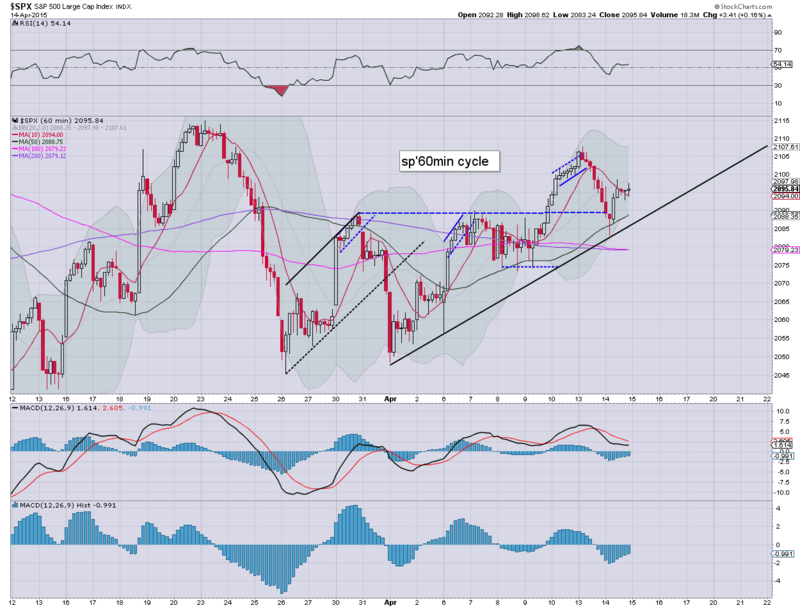 Near term outlook remains bullish, with the sp'2130/40s viable within the next few weeks. Equity bears have little realistic hope until at least mid May. 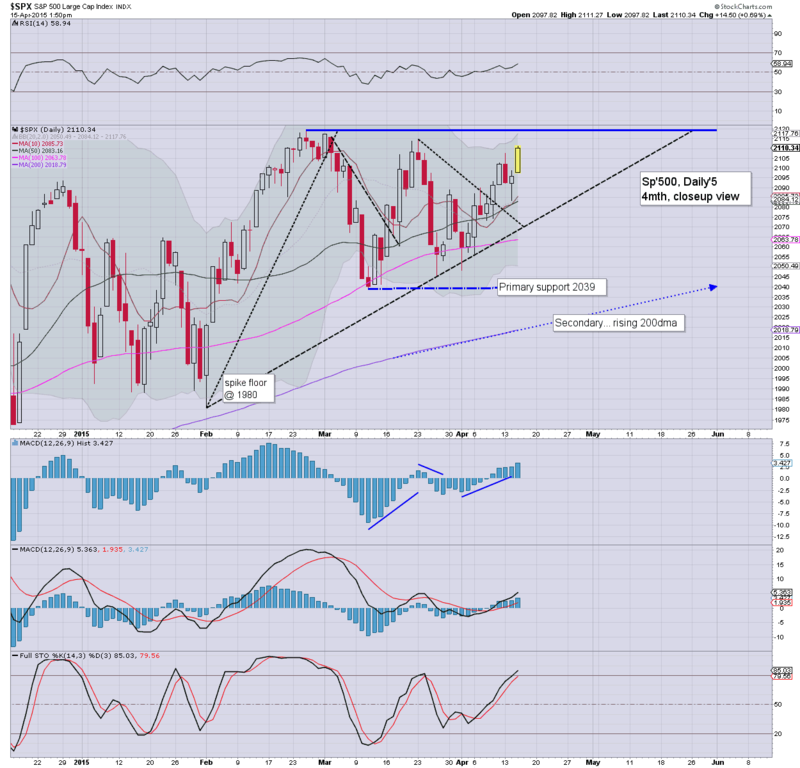 Broadly.. market looks set for a weekly close in the sp'2120s.. and continue climbing into May. *I exited INTC (long) in the early morning.... picked up TWTR (long).. in the afternoon. 4.10pm.. NFLX earnings: ... missed, EPS 38 cents vs expected 69. However, subscriber numbers were good. *a likely stock split looks due... a 5 for 1? That will at least make the option calls more tradeable! US equity indexes look set for a second consecutive net daily gain, with the sp'500 within 0.4% of breaking a historic high (>2119). It remains highly notable that the second market leader - R2K, along with the 'master index' - NYSE Composite, have both broken historic highs today. So.. a second day of gains, and dare I say, I am somewhat bemused to still be seeing some tout sig' down waves within the near term. 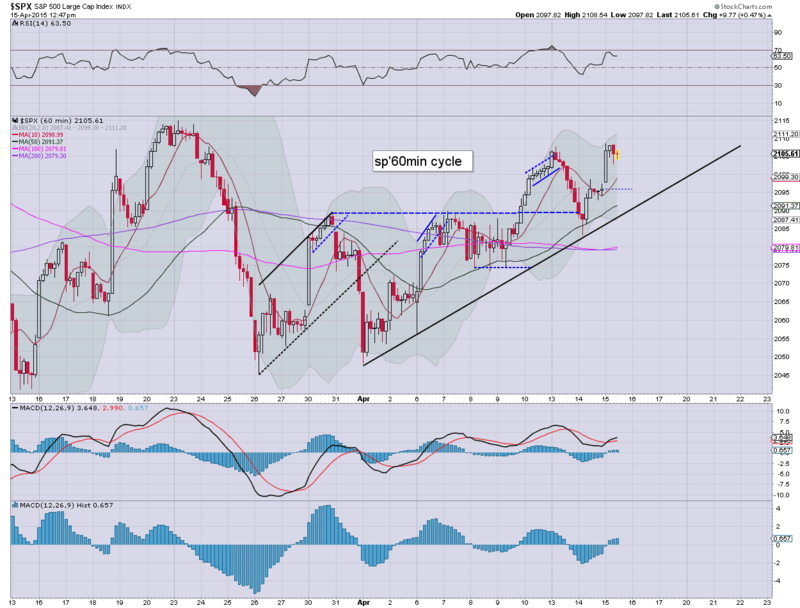 Market looks set to climb into May... but with the threat of mid June... not least if Oil prices can help drag energy stocks much higher (I'd refer anyone to the daily/weekly charts for... RIG, SDRL, APA, XOM... CVX). notable strength: energy, CHK, +4.8%... as oil and gas prices continue to climb. The latest Fed beige book is due at 2pm, the algo-bots will be ready to digest some words, but overall, market looks set for a second consecutive daily gain. Metals have built further gains, Gold +$9. Oil is similarly still on the rise, +4.5%. 2.03pm... it'd seem the Fed is leaning on the positive side (why wouldn't it?)... 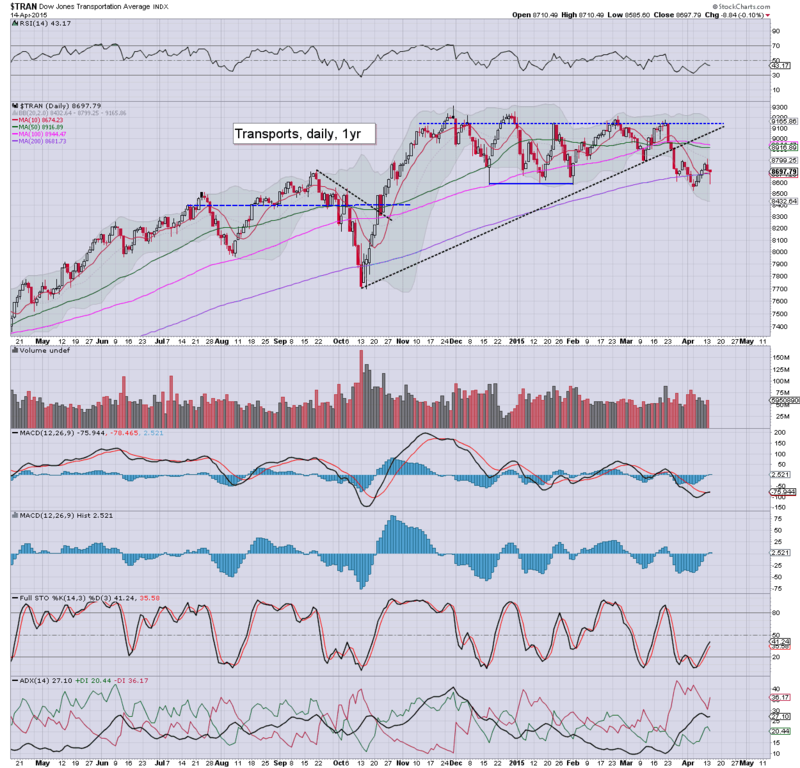 indexes look set to battle upward into the close. A weeky close in the sp'2120s... now looks probable. Market looks set for a net daily gain.. new historic highs for the sp/Dow.. look due. 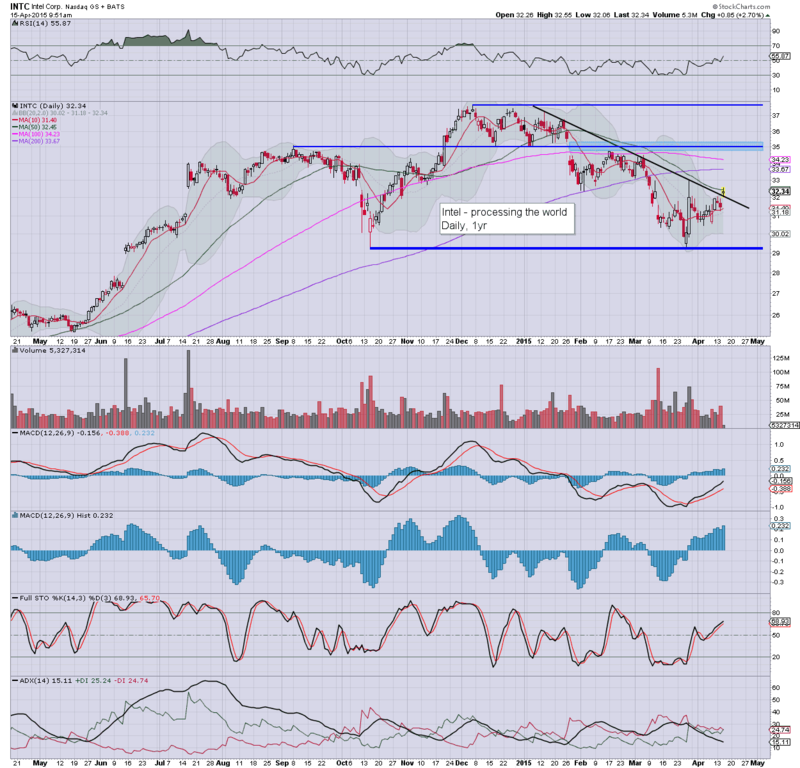 Notable strength: INTC +4.7%... battling for the $33s... where the 200dma is lurking. 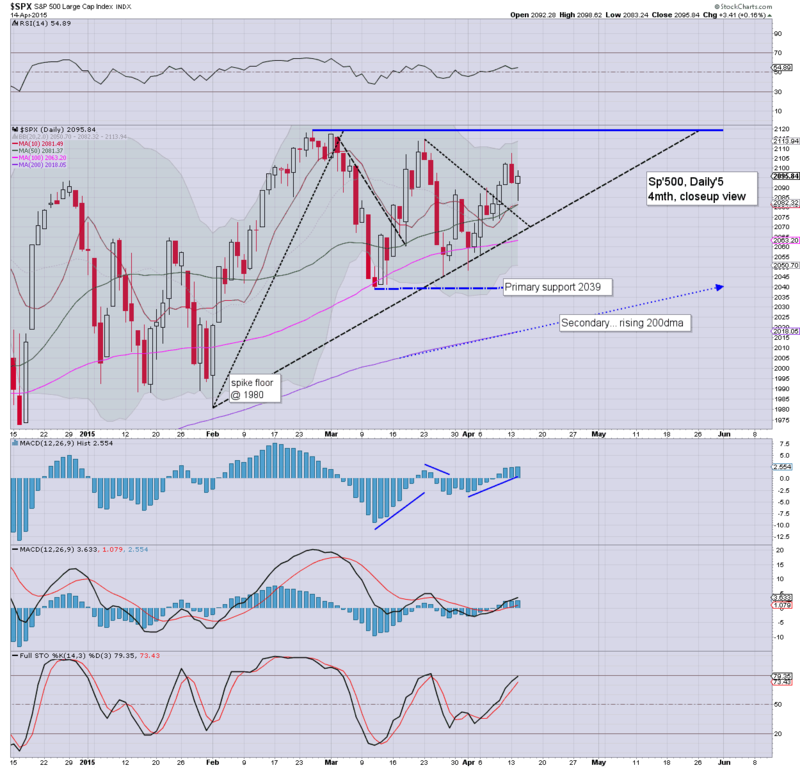 US equities are seeing a touch of chop, but still look set for another net daily gain. VIX is naturally in cooling mode, -3.5% in the 13.10s. 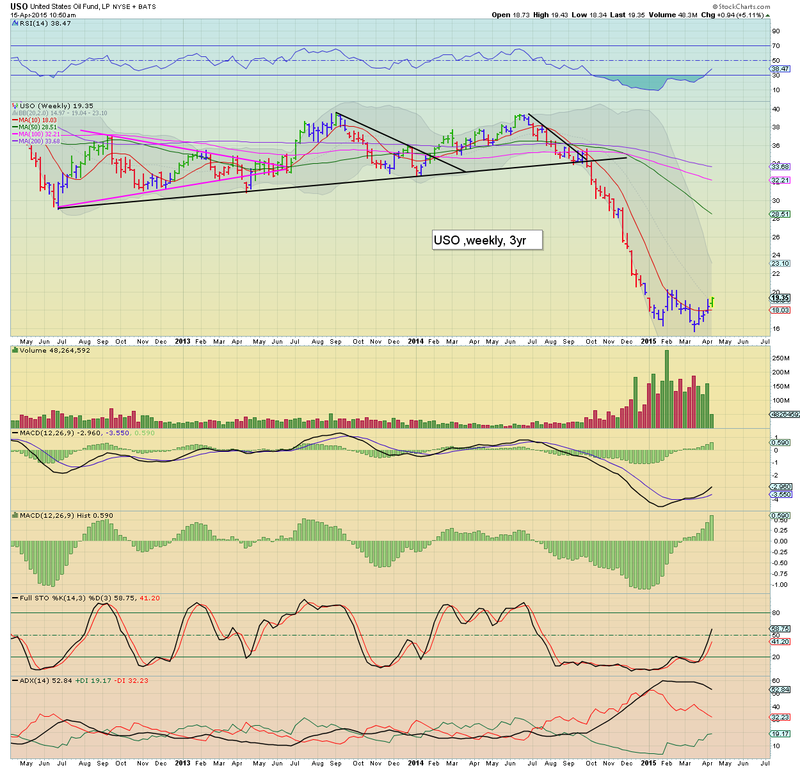 There is notable strength in Oil, +3.9% in the $55s. Metals are holding moderate gains, Gold +$4. Oil is clearly headed for the $60s... whether next week.. or not until early May... makes little difference in the scheme of things. Regardless of any weakness this afternoon (not least after the Fed beige book at 2pm)... underlying price pressure remains bullish. 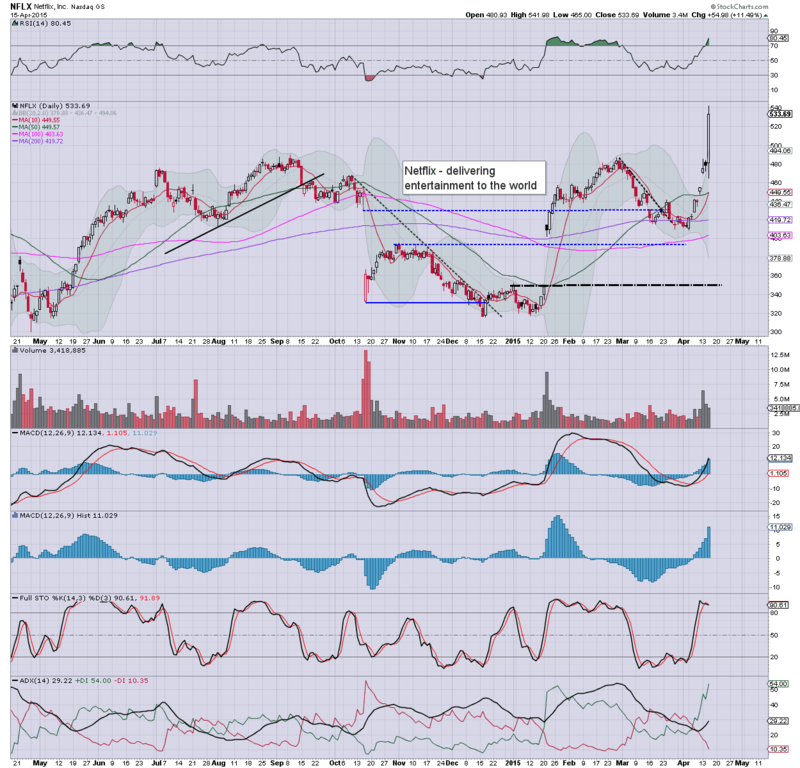 notable strength: INTC +4.3%. Seemingly headed for $35.. at least. time for some chilled drinks... its summer! 12.05pm.. Long TWTR.. from $51.20... am looking to drop on the next up wave.. somewhere in the 53/54s... before earnings... and be long again for earnings (Tue Apr'28th). Anyway.... back to the drinks. Whilst equities are holding moderate gains, there is notable strength in Oil, +2.8%... into the $55s, as the weekly surplus totalled just 1.3 million barrels. 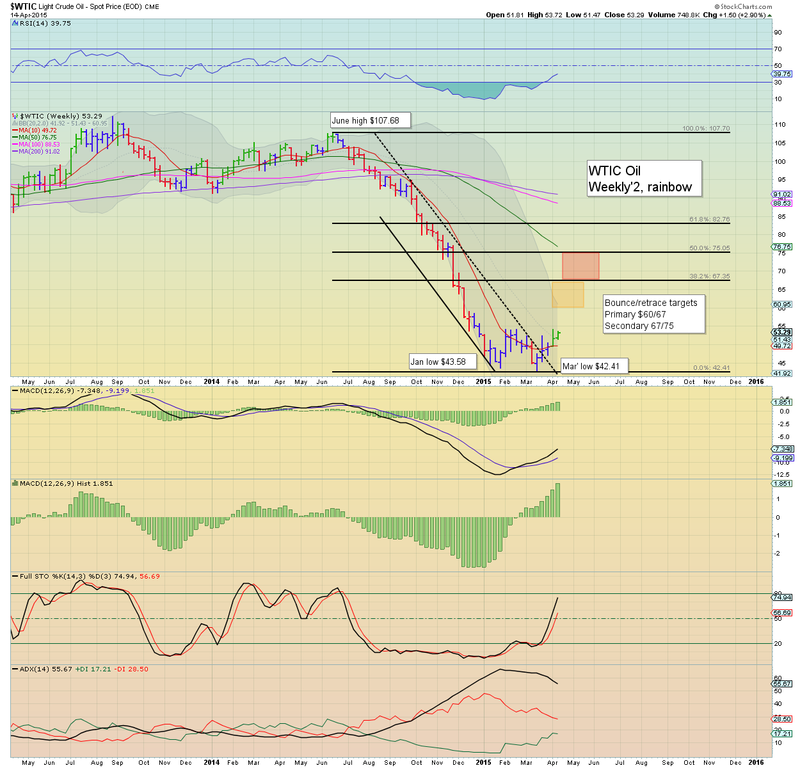 WTIC is headed for $60... perhaps the $67/75 zone before the next big wave lower. *it is highly notable that the R2K and NYSE Comp' indexes are trading at historic highs. The rest of the market looks set to follow. So.. a green candle on the USO weekly chart.. clarifying what the WTIC weekly chart presented last week. The $60s look an easy target within the near term... despite the issue of over-supply NOT remotely addressed. notable strength: oil/gas drillers, RIG +5.5%, SDRL +4.8%.... following Oil. US equities are battling higher, with a new cycle high of sp'2108... a mere 11pts (0.6%) from breaking a new historic high. Metals are choppy, Gold +$1. Oil is building sig' gains of 1.3%, but will remain vulnerable at least until the EIA report is out of the way. So... we're seeing upside follow through, and bears look toast for rest of the week. There is a fair bit of ECB chatter this morning... not least due to the 'drama'. 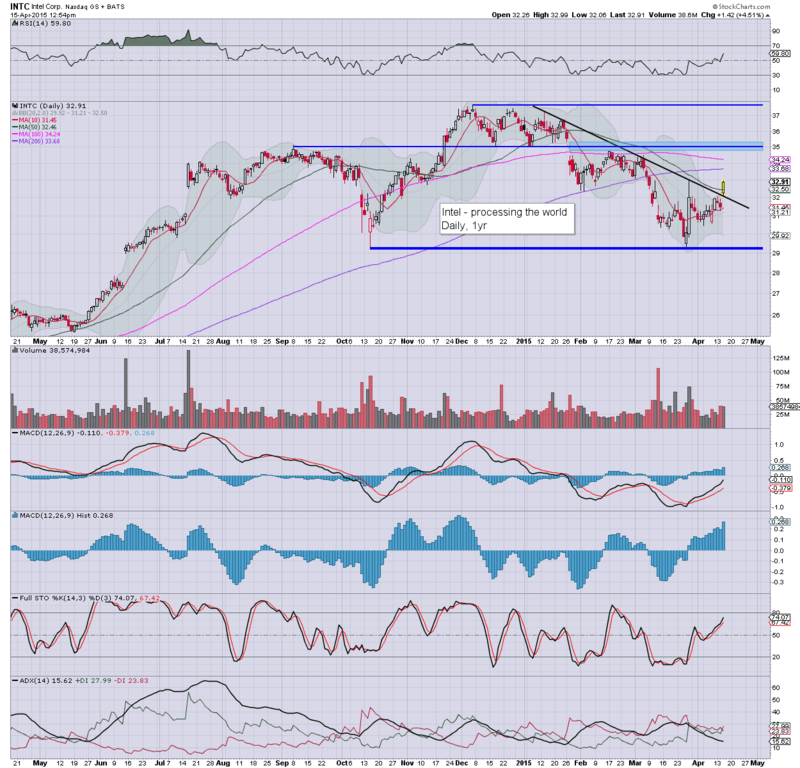 A clear break above declining trend/resistance.. the door is open to initial target of the $35s. 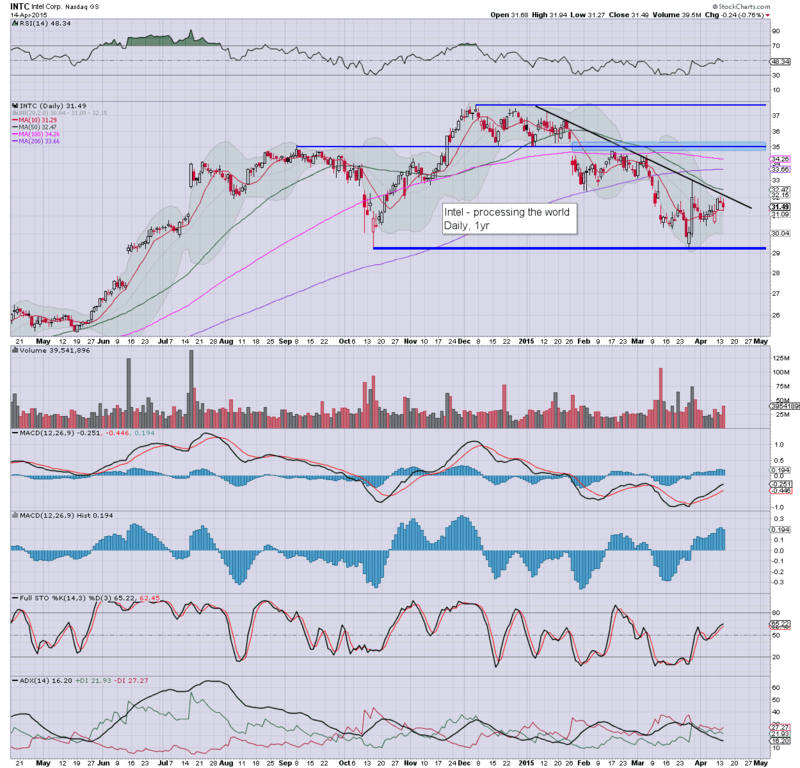 *I bailed on INTC at the open... but remain long term bullish on the stock. Will consider getting involved another day. Good morning. Futures are moderately higher, sp +6pts, we're set to open at 2101, a mere 0.8% from breaking a new historic high. Metals remain weak, Gold -$2. Oil is holding early sig' gains of 1.4%.. ahead of the latest EIA report. We have a fair few bits of data today, along with two fed officials this morning. This afternoon the market will have eyes on the latest Fed beige book.. which will likely turn attention to Q1 GDP.... due Apr'29th. Market looks set for new historic highs in the near term, and it would seem a reasonable target for June is the monthly upper bollinger.... somewhere in the 2170/80s.. or so. The break above the declining trend/resistance of $32 is pretty significant. A climb towards $35... if not the low 40s by June looks underway. *I am long INTC from Monday.... as an earnings play, I will look to drop early this morning, but am most certainly broadly bullish the stock across the longer term. 9.34am.. EXITED INTC-long... from $32.35.... not as good as I was looking for.. but it'll do. 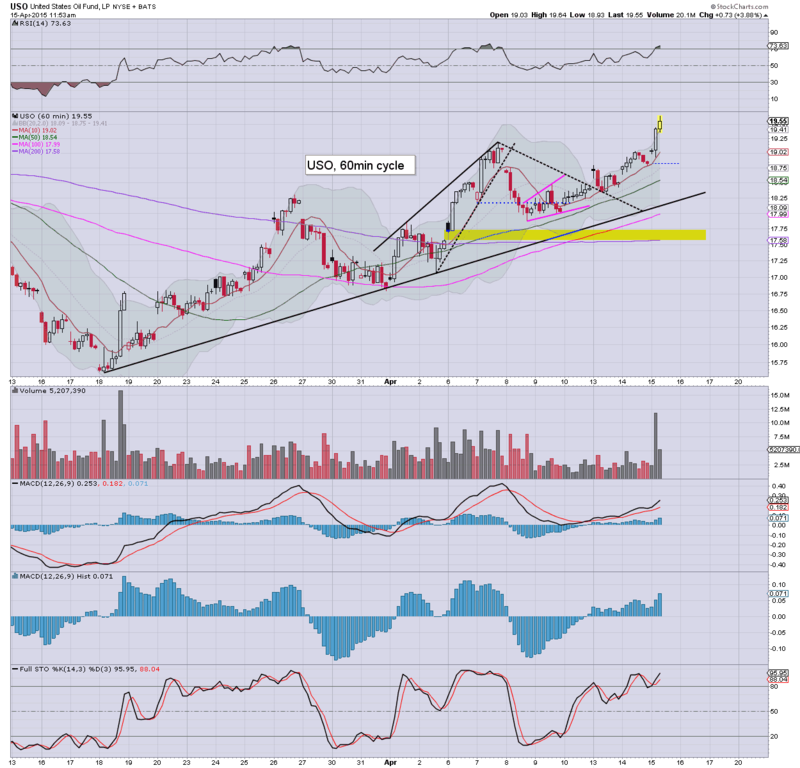 *opening black-fail candle on INTC.... I may have just exited at the top. 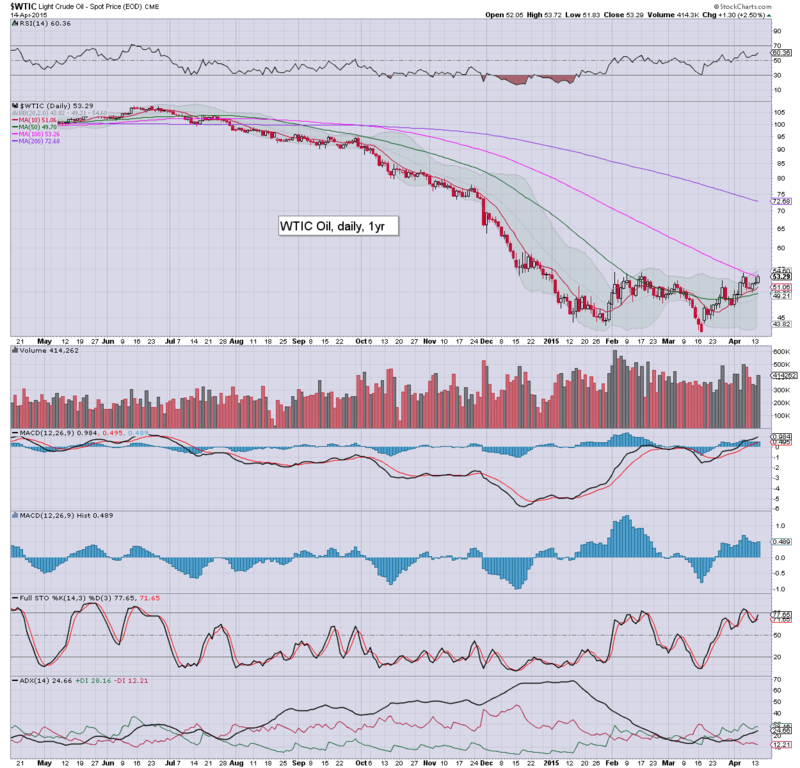 WTIC Oil prices settled higher for the third consecutive day, +$1.30 (2.5%) @ $53.29. First upside target is the $60 threshold. A major multi-month bounce/retrace looks underway, which should likely max out somewhere in the 67/75 zone this summer. Over supply remains a key issue, but for the moment, the market is still managing to drive the underlying price to the upside. Certainly, the $60s look viable within the near term. Regardless of the next set of API/EIA reports, Oil looks set to claw higher into the summer. Wed' will see Empire state, Indust' prod, housing market index, EIA oil report.. and a Fed beige book (2pm). *Fed officials Bullard and Fischer will be speaking in the morning, and Mr Market will be closely listening. US equities closed a little higher, sp +3pts @ 2095. The two leaders - Trans/R2K, settled -0.1% and u/c respectively. 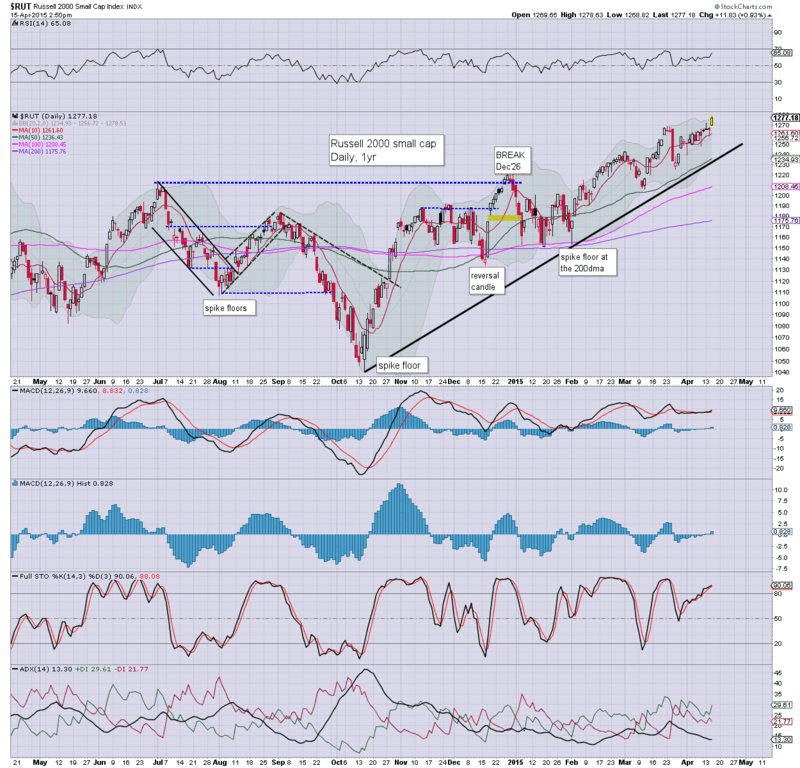 Near term outlook is bullish, with new historic highs for all indexes due... inc' the Nasdaq Comp (>5132). Equities saw some moderate weakness in the morning, but as usual, the market saw something of a latter day rally. New historic highs look due for all indexes in the coming weeks.